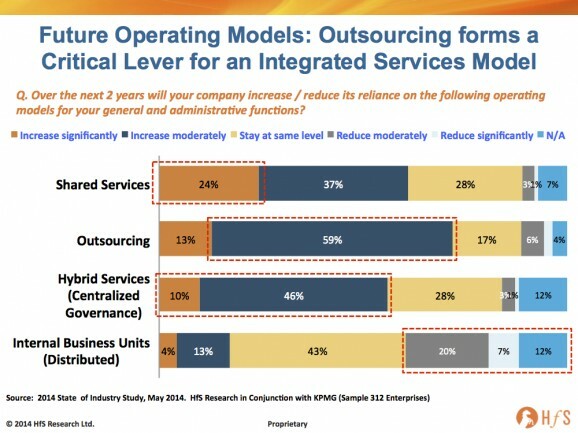 It's official: outsourcing is not dying - it's simply become a key part of a broader enterprise operations strategy: Integrated Global Services. 312 buyers recently shared their investment intentions over the next two years during our 2014 State of Outsourcing study, conducted with support from KPMG, and their operations strategy clear: one in four are reinvesting heavily in their global shared services operations, while seven-out-of-ten are continuing to make (largely moderate) investments in their outsourcing delivery. Shared Services makes its strongest re-emergence as a delivery model for a decade. While the broad number of firms increasing their focus on both the outsourcing and shared services models is relatively consistent over the past 3 years, the difference today is the intensity of investment. Outsourcing has slowed to a more moderate pace, while a number of large-scale enterprises are focusing on moving more work into their internal shared services centers - the first time in a decade we are really seeing shared services making a reemergence of this magnitude. Buyers are shifting more of their higher-value work into their offshore shared services operations. It's become abundantly clear that buyers are now aggressively globalizing their operational strategies and are leveraging their offshore shared services centers, almost as much as their outsourcing providers, as they seek to move more work from their internal business units into an integrated centralized services delivery model. As our previous post from the 2014 study emphasized, close to 3-out-of-10 enterprises are increasing the offshore component of their finance and accounting, over the next year, into both their shared services and outsourcing operations, while similar trends are occurring across IT, procurement, HR, industry-specific and customer service functions. From our discussion with multiple buyers of late, many are moving much of that next wave of business processes into their offshore shared services that require a greater deal of context and specificity to their own businesses and, in many cases, compliance requirements. Providers need to earn the trust of their clients in order to take on higher value processes. In many cases, providers need to prove they have the capabilities to move beyond highly transactional processes before their clients will trust them to take them on. We will discuss this dynamic further in our next post on the study, but far too much outsourcing today has struggled to delivery value beyond transactional process delivery, usually because of the talent deficiencies on the buy side and mismatched expectations on the provider side, as buyer expectations evolve during the course of a relationship. The integrated services model is going to force ambitious providers to evolve their capabilities if they want to survive in the long-term. The traditional global services model has evolved largely by transactional work being moved initially into shared services centers and buyers eventually outsourcing that work to providers as it becomes easier to "shift", once is has become centralized into a smaller number of locations. Now a similar cycle could well be happening with middle and front office processes. However, as global management of integrated processes matures, and buyers become increasingly adept at developing their own offshore management competencies, it is not guaranteed that the majority of buyers will continue to look at the traditional outsourcing model down the road (and several are already evaluating their future sourcing strategies). In short, there are multiple levers now available to clients seeking greater productivity and value, such as SaaS-based business platforms, high-value analytics tools and skills, better automation and robotization of their processes, and simply hiring their own offshore teams to do the work, as opposed to paying the (often higher) rates of the providers. Hence, those providers which are getting ahead of the disruption curve and supporting clients with more productivity tools and capabilities beyond simply offshore arbitrage and process standardization (read earlier post), are the likely winners down the road as clients integrate their global services delivery. In today's global operations environment, many buyers are getting smarter and figuring out they can do a lot more themselves. Many are evaluating the potential of new tools and technologies, niche provider capabilities and managed governance services as vehicles to find new sources of value. While there are clearly several more years of productivity improvements to be made simply shifting work to lower cost locations and tweaking processes, eventually buyers will have to transform their current operations model from the status quo of today. Simply plastering more and more lipstick on the same old pig is eventually going to fail for many, and transforming the global operations model into an integrated range of services, underpinned by cloud-based platforms, plug-and-play digital capabilities and supported by teams of innovative and analytical staff is the promised land most ambitious clients yearn to (one day) find for their organizations. Providers need to prove they can do more than basic operations, otherwise outsourcing runs the risk of becoming a staff augmentation model for flexing operations as opposed to a strategic partnership between provider and buyer that can add more skill, technology and analytical capability for clients. Fantastic article - I believe another important fact is that A Business Process Outsourcing can be decomposed into several sub-processes, which have their own attributes, but also contribute to achieving the goal of the super-process. So it can also be a reason for outsourcing to not die out soon.